WASHINGTON (Reuters) - U.S. Attorney General Eric Holder plans to stay on through November's mid-term elections and has no timeline for an exit after that, a Justice Department official told Reuters on Friday. "The Attorney General does not plan to leave before the mid-terms. That does not mean that he is definitely leaving after the mid-terms, just that he is at least staying through that time," the official said. There has been speculation over when Holder, 63, might step down from the post he has held since shortly after President Barack Obama took office in 2009. Should Republicans win control of both chambers of Congress in the November elections, it may be difficult for a potential replacement for Holder to be confirmed. 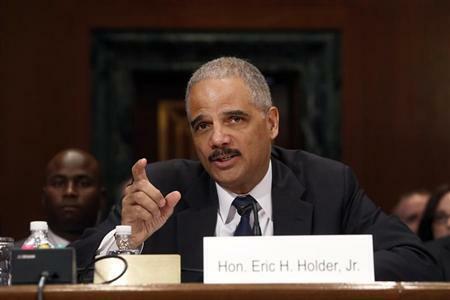 Among Obama's cabinet members, Holder is said to have one of the closest relationships with the president. During his time in office, Holder has taken on issues in line with the president's agenda, such as civil rights, voting rights, and most recently, reducing sentencing for low-level drug offenders. The Washington Post reported earlier that Holder planned to stay through the elections but could not confirm his plans beyond that.